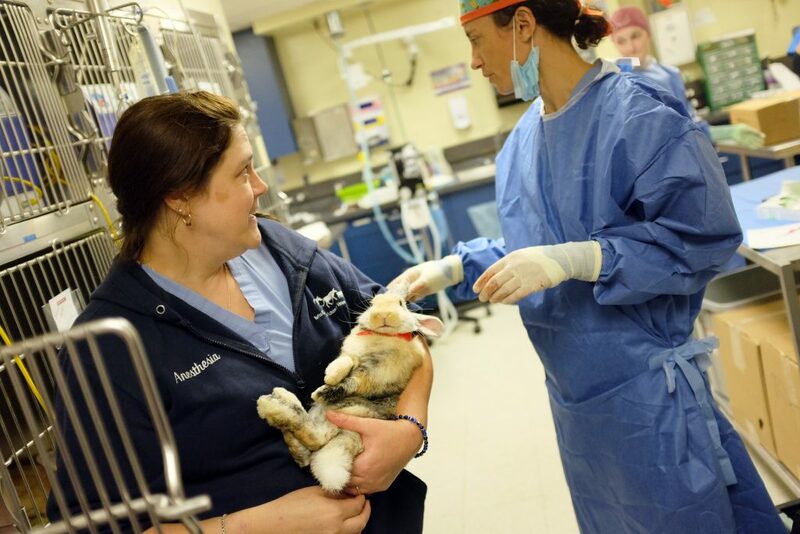 Our mission is to instruct veterinary students in the best practices of small-animal sterilization surgeries, to provide free or low-cost services to pets in need from the surrounding community, and to provide the surgical training component for the Tufts Shelter Medicine Program. The Luke and Lily Lerner Spay/Neuter Clinic provides the following free or low-cost services to pets in need from the surrounding community. Veterinary students are observing Dr. William Rosenblad demonstrate a technique at the Shelter Medicine Program's Dental Day Elective in the Lerner Spay/Neuter Clinic. A veterinary student enjoys some quality time before she begins her Advanced Surgery Elective in the Lerner Spay-Neuter Clinic. A student checks on a dog during a clinic at the Lerner Spay/Neuter Clinic.